When are you Eligible for a Second FHA loan? If you have already had an FHA loan and want to apply for another FHA loan, you might not qualify if you have been through bankruptcy or foreclosure. 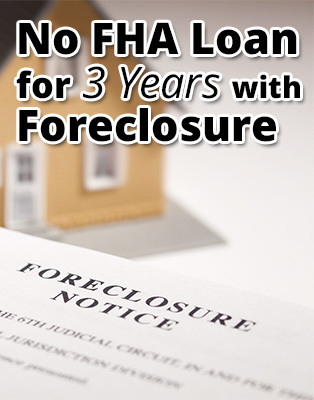 After going through foreclosure, you must wait three years before you can be eligible for another FHA loan. If you’ve been through bankruptcy, you must wait two years before you can apply for a second FHA loan. Another way you might not qualify for a second FHA loan is if you have a claim on your CAIVRS report, you must get the claim removed before you can get an FHA loan. Before an applicant can be approved for a loan they must first pass a credit screening. Most lenders use the CAIVRS system to pre-screen applicants. The acronym stands for Credit Alert Verification Reporting System. CAIVRS is a Federal database of people who have delinquencies on any kind of Federal debt. Each of these departments has access codes to use the system. CAIVRS is widely used, with about 61 thousand user IDs in existence. All Federal Credit agencies that offer lines of credit must use the system to screen for loan eligibility. The Office of Management requires that these agencies check their applicants for Federal debt. If the lender conducting the screening finds that you are delinquent on a debt, the CAIVRS system will list which agency has reported you as delinquent, the case number, and the kind of delinquency, whether it is a foreclosure, a lien, a claim, a judgment, or a default. A borrower cannot be eligible for an FHA loan if their name is listed on the CAIVRS system, unless they have an approved repayment plan with the Federal agency they are indebted to or they repay the debt in full. However, three extenuating circumstances exist in which the applicant, appearing on a CAIVRS report may still be able to receive financing. Divorce: If the other party was awarded the property, assumed payment responsibility and then defaulted on the payment after the divorce was finalized, the applicant may still qualify for a loan. Bankruptcy: The applicant retains their eligibility if the property was included in a bankruptcy filing and the circumstances surrounding the filling can be proven out of the control of the borrower. Assumptions: If the applicant sold property to a buyer who defaulted on an assumed payment, their eligibility for a loan will not be impacted. It is not uncommon for applicants to mistakenly appear on a CAIVRS screening, this is an easily resolved issue. Contact your lender, find out which agency has listed you and then provide the appropriate documentation to your lender, illustrating up to date payments. This will allow your lender to get you removed from CAIVRS. If you currently have an FHA loan and want another loan at the same time, the second mortgage can only be granted under certain conditions. Aside from these conditions, all FHA loans must be used for principal residencies only, whether it is your first FHA loan or second FHA loan. One way you can be granted a second FHA loan is through relocation. If the distance you are relocating is far enough away from your first residency, you are eligible for another mortgage. You are also eligible for a second FHA loan if your family size increases. Additionally, if you are leaving a home that is co-owned you may qualify for a second FHA loan. This is typically used in divorces where one of the spouses moves out and buys a new home. The last instance where you can have two FHA loans simultaneously is if you co-borrow with a family member for a loan, but you also have your own primary residence property. If you have been through bankruptcy or foreclosure, are trying to remove a claim from the CAIVRS system, or have any questions about getting an FHA loan, call Federal Home Loan Centers at 877-432-5626.